During our recent stay in St. Augustine, FL, we were provided with tickets to so many fun tours and attractions by the St. Augustine Visitors and Convention Bureau. 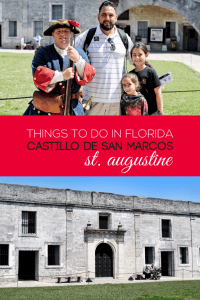 I’m continuing our “Things to Do in Florida” series with the famous Castillo de San Marcos National Monument in St. Augustine, FL. When we decided to take a road trip to St. Augustine, FL, it was partly because of the historical aspect of the city. We are always taking the kids on fun adventures, but we also wanted them to be able to learn during their Spring Break. With over 340 years of history, this beautiful monument exceeded our expectations and showed the girls that learning can be fun too! Some refer to Castillo de San Marcos as a fort and others, as a castle. I had read about it in books and had seen pictures of it, but standing there with my family, really confirmed that it’s something you have to see in person, to really appreciate. It took my breath away. The structure itself is made of coquina and is one of only two forts in the world built out of this semi-rare form of limestone. Imagine a building made of seashells that was able to withstand not only our crazy Florida weather, but actual attacks and canon fire AND is fire resistant! It’s no wonder people travel from all over to get a glimpse of this magnificent monument. As you walk from room to room, you are taken back through history. I love that they have people working there who are able to answer any question that is thrown at them. And if you have kids, you know that they come up with some doozies! They were so patient with the girls’ questions and actually took the time to help them to understand what they were looking at. While there are no rides and no cartoon characters to pose with, my daughters were able to find the excitement in learning what had gone on at the Castillo de San Marcos over the last 300+ years. They loved checking out the canons (which Falynn took very seriously, as you can see in her picture below) and standing at the tallest point, looking down at the beautiful city of St. Augustine. They loved walking through each room, reading what it was used for and imagining what it would be like to live in such an interesting structure. Construction began on the Castillo de San Marcos in 1672 and lasted 23 years! It’s truly a place that both young and old should visit so if you haven’t, make sure to add it to your bucket list! You can climb to the top and sit and watch the boats sail by or take a tour. There is so much to examine and learn from the oldest structure and main attraction in St. Augustine, FL, sitting on 320 acres. If you’re in the area, or planning a trip to St. Augustine, FL, we highly recommend stopping by to see the Castillo de San Marcos National Monument. And make sure to check out all of the other fun attractions in St. Augustine, including the Whetstone Chocolate Tasting Tour and don’t forget to stop by our favorite restaurant, St. Augustine Seafood Company. Have you ever been to St. Augustine, FL? Comment below and share your experience! Thanks for alerting readers to what a fantastic destination St. Augustine is! Our oldest city in America, and one so rich with culture and great sites! Oh what a fun and education family adventure! We’ll have to check out Castillo de San Marcos National Monument at some point! That looks like a great place to visit. I love to go to places where you can learn about the history of that certain place and learn new things. Florida has History. a lot of it. looks like you had fun though. Your pictures are gorgeous! We love all of your recommendations. This spot is full of some awesome history! I wish I was closer to it so I could go see it! Thank you for this beautiful post. I have never been to Florida and this gives me an idea about its history. We will have to keep this in mind for when we go to Florida! We also are looking to take a road trip to Florida thanks for sharing your experience! What a beautiful and historical place! I am sure you all had a wonderful time out there! I have never been to Florida but we will have to add this to the bucket list! I love historical sites! I grew up in South Florida and we went to a bunch of school trips to St. Augustine, it was a lot of fun, and I have some fun memories I haven’t been in years though, easily 8. I had no idea this was in Florida. It is not a ride or a cartoon character, as you said, but it is pretty interesting. Lots of history. i grew up in south florida and have not been to a lot of these places and done these things. i really need to think of maybe going next time i am in florida. I guess this was a very fun day, with interesting stuff to learn! You guys are looking great! This looks like such a cool place to visit. We’ve been wanting to visit Florida for a while, and there is really no shortage of things to do! This would be a great way to learn some history and culture along our trip. This sounds like a wonderful trip. I used to live in Fl, but unfortunately I never even knew about this. I’d love to visit. Planning a trip to Florida this year. I’ll have to add this to my list! Florida is such a fun place to visit, there’s so much to enjoy there, from theme parks to aquariums. I think this place it amazing and the kids can learn so much from it! That’s a beautiful place to visit! Full of history and culture, love it! This is an interesting monumental history! Fort or a castle, I sure want to visit these kinds of places holding so much history. I remembering visiting St. Augustine when I was littel and it always fascinated me. There is so much history for kids to learn about. I love travelling! And love to visit places like Castillo de San Marcos, places that are full of history and stories to tell. i would love to visit it one day! Looks like great place to visit and lot of history attached to it. When I visit Florida I will try to visit this place . thanks for sharing the info. We love visiting historical places such as this. We’ll keep this place in mind once we get the chance to visit Florida. I love that they have taken the time to set up each room and answer all questions so thoughtfully. I think that really helps someone get the most out of this historical experience. Your photos are amazing. Looks like a great place to visit. As much as I’ve been to Florida, I didn’t know any of this exists~ How cool! That place has a lot of great culture. I would definitely check it out if I could! It looks like a nice place to visit and exploring it is a great adventure. I am sure my kids will definitely enjoy this place too. I had not heard of this location before, but it looks like you got some really beautiful pictures. Thanks so much for sharing. I’ve been to St. Augustine and loved the entire tour. It’s a great experience for kids and grown-ups alike. So much to learn and see. The history is just amazing. Wow, that is so awesome. My husband loves going to places like this. Maybe we will be able to see it this summer when we visit my brother down that way. This looks great and different from the other things people normally do in Florida. A good way to learn some history. I bet these are all fun! These are all amazing place that I would love to see. I would love to visit with my family. Pinning this for later! It looks like a nice place to visit and exploring it is a great adventure. I am sure my kids will definitely enjoy this place too! Thanks for this information. I had no idea this historical opportunity existed in Florida although I have gone there several times for work. I love checking out new places in the cities I travel to. wow! oen thing i always do when i travel is to learn about their history. glad thay have something like this in florida! thanks for the info! St. Augustine is one of my favorite places! Were you able to see them fire the canons? I also love the ghost tours you can take of the city at night! Ive never been to St. Augustine but Ive heard many great things about it. I would love to visit. Looks like you and your family had a wonderful time. What a wonderful trip! I love taking my kids to living history exhibits and showing the artifacts in their own setting. It makes such a huge impression. This would be an awesome place to explore. The boys would also get a history lesson too. Hands up I absolutely LOVE history so going somewhere like this monument is right up my street – it looks incredible to be able to go and explore it. My son loves history. This year they learned all about the Westward Expansion. I think he would love learning about the history behind Castillo de San Marcos and seeing an exhibit like this. Wow! Looking at your pics reminds me of our summer in Kingston, Ontario and when visiting Fort Henry. Very similar, naturally of course! I LOVE Castles!!! What amazing history and architecture! If I visit Florida I will have to check out this beautiful castle! Wow! Now I want to take a break and go somewhere half decent! OH WOW!! I had no idea FL has anything like this!!! I always associate it with Disneyworld! haha!